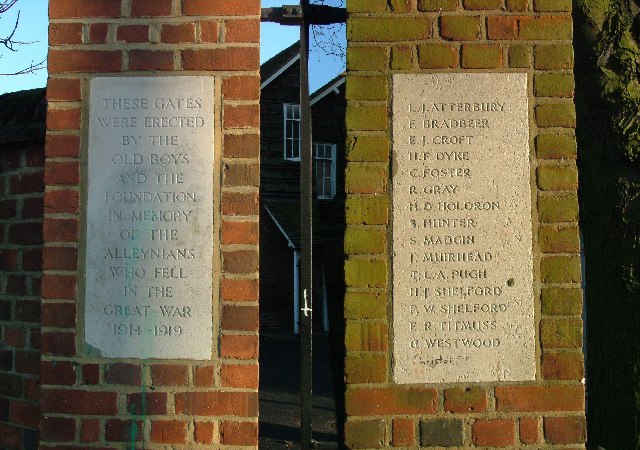 This photo was taken by Robin Hall and is a composite of the two gate posts to the school. This photo is taken from the website www.geograph.org.uk and is copyright Robin Hall and licensed for reuse under this Creative Commons Licence. This page was added on 16/12/2010. School motto… Nisi dominus frustra. I was told that when Alleynes was a private school every Tuesday was Latin day. Pupils were required to ONLY use latin for the duration !!!! I cannot envisage that pupils of the Thomas Alleyne school would wear caps today (as with all modern schools). However in the late 60s, we had to wear them up to the end of the first term of the third form; and such was by edict of ‘Black Bart’ which was the pupils’ nickname for the terrifying headteacher JBA Burridge. Mounted in the centre of the gates the shield bearing the school crest and motto. (Not shown in the photo.) I suspect the rules have changed since I was at school, but every time anyone passed through the gates it was required to touch the peak of one’s cap in salute to those fallen pupils – do current pupils even wear a cap now? Back then, if you were spotted not acknowledging the mandate, a master or a prefect could issue a 25 minute detention on the spot, as I found out to my cost on a few occasions.